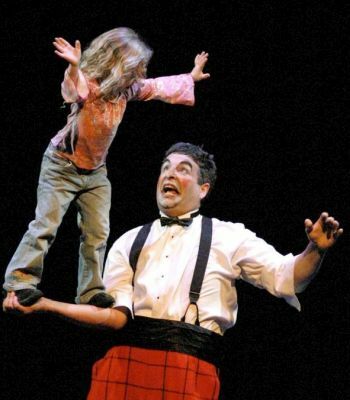 Jeff Raz has performed internationally for decades, starring in circuses (Cirque du Soleil, Pickle Family Circus, Song Circus), variety (Vaudeville Nouveau) and theaters, including Servant of Two Masters at Berkeley Rep, La Bête at TheatreWorks, Comedy of Errors at Lincoln Center and Midsummer Night’s Dream at Marin Shakes. He has directed dozens of circus, puppet and theater productions, including The View from Here with Zaccho Dance Theater, The Bright River with Traveling Jewish Theater, Snake in the Basement with Lunitique Fantastique. He is a graduate of Dell’Arte International, has written 17 plays and recently launched his first book, “The Secret Life of Clowns” at the Smithsonian Folklife Festival (http://secretlifeofclowns.com). Jeff cofounded Vaudeville Nouveau in 1982, the S.F. New Vaudeville Festival in 1985, the Clown Conservatory in 2000 and the Medical Clown Project in 2010. He continues to direct, write, perform, and teach as well as work globally as a communications consultant.